Cute coastal cottage . New granite counter tops!!! !NEWLY REPAINTED AND REDECORATED! 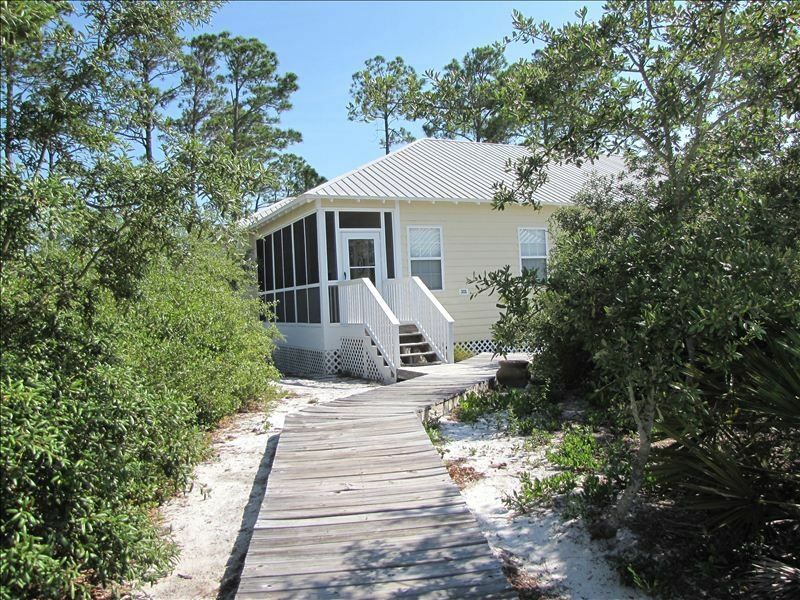 Our Cottage is located in The Rookery- a family oriented community near the beach (within walking distance). It is a nature lovers paradise with lush, native trees and plants surrounding the property. It is the perfect place to relax, unwind, and kick off your flip flops. Our unit has 3 bedrooms (king, queen, 2 sets of bunks), 2 full baths, living and dining areas, full kitchen, as well as an enclosed porch- complete with rocking chairs. The community has 2 pools- a large zero entry pool with hot tub and bathroom facilities and a smaller more secluded pool, BBQ area, and tennis courts. Our family has been taking vacations to Fort morgan since 2005. We enjoy visiting the area so much, that we decided to purchase a home. Fort Morgan is off the beat in path. It is peaceful and quiet. If you are looking to get away from traffic as well as the hustle and bustle of city life, then Fort morgan is the place for you. We had a great time! The cottage was everything we hoped it would be. We didnt mind the drive out from the city as it was so quiet compared to down in town. And huge plus that the beach entrance was that close! We plan to come back next year so that should tell you how much we LOVED it. We loved the place. It was a perfect setting for what we wanted to do on our vacation. We have talked numerous times about how much fun we had and how the place was perfect for us. if I may suggest a couple things, we had a couple issues with the parking. With there not being any assigned parking or any markers for spots it got a little chaotic a couple days while we were there. Also, we talked to several renters and they said they were given an option of renting the golf cart with their unit. That would have been awesome if we would have had that option. We will definitely be returning to the area and The Rookery!!!! My family and I truly enjoyed our stay here. The pictures do not do it justice and it we very large to fit my family of 8! Everyone in the community was super friendly and the pool was a great hit for my kiddos! We loved that the beach we so close as well and we would highly recommend this cottage to any of our friends and family! The pictures do not do this place justice. It’s a beautiful beach cottage with lots of room and all the amenities of home. Our family enjoyed relaxing on the porch, the beautiful pool and time at the beach. It was the perfect getaway. I do recommend this place.